It’s Friday and give away time again on Lavender and Lime. Gordon Ramsay has to be one of my favourite TV personalities, and I would love to have the opportunity some day to cook alongside him. 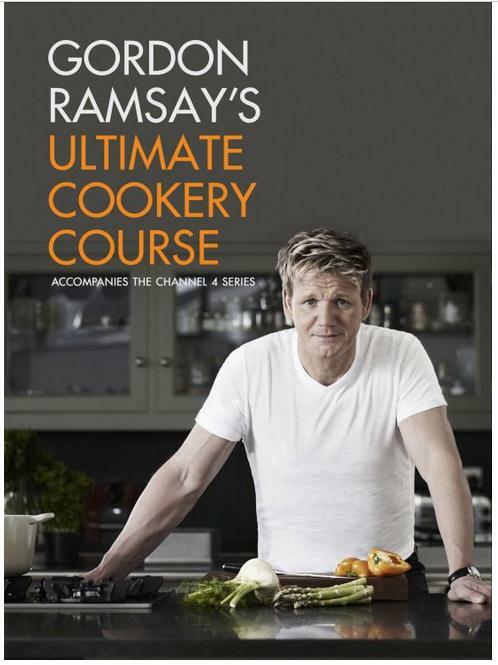 Until then, I will have to make do with browsing through his new cookbook Ultimate Cookery Course. Checkers have given me a signed copy to give away on my blog. All you have to do is leave me a comment and tell me why you should win. Bonus entries will be counted if you tweet me your response using the hashtag #RamsayRatesCheckers (and you can enter as often as you want on twitter). The winner will be decided by random draw and my decision is final. This competition is only open to South African residents and closes at midnight on the 19th of October (South African time). Internationally renowned chef Gordon Ramsay has put local supermarket chain Checkers and their butchery to the test. Chosen because of his reputation as the world’s toughest food critic, Ramsay appears in a new Checkers’ advertising campaign endorsing their premium meat ranges. The famous British chef, known for his no-holds-barred attitude when evaluating food and chefs alike, has put Checkers’ meat through its paces. Checkers has worked hard to improve their premium meat range and the South African giant’s partnership with Ramsay, who currently holds 12 Michelin stars, demonstrates the confidence they have in their offer. The decision to use Ramsay was backed by research to find the most credible food critic in the eyes of the public. Ramsay was impressed with Checkers’ wide variety of extra-matured steaks in the Steakhouse Classic range and remarked that the cuts were both properly matured and displayed perfect marbling “just like you’d find in a top restaurant”. Ramsay goes on to pronounce the company’s naturally-reared free range lamb which is free of antibiotics and hormones as “perfect”. The famous British foodie also sampled some local Championship Boerewors. According to Ramsay, it is a no-brainer as to why its South Africa’s best-selling boerewors. The fact that venison is also available all year round confirms that Checkers would be a butchery he’d buy from. Disclosure: I was approached to run this competition on my blog in exchange for a signed copy of the recipe book. This post is in line with my blogging policy. Good morning ladies and gentlemen, It’s Monday!!!!! At long last!!!!! Congradulations to todays winner!!!!! The anticipation is killing me and I can’t wait to find out who won!!! Drum Roll!!!!!!!! Hi Kyle, the post is up – http://tandysinclair.com/winners-announced-2/ – I am sorry it was not you, but please keep on entering when I run competitions! I wonder who won… Well congradulations to the winner!!!! May the luckiest man or woman win!!! I am special and I need help. Having worked my way through Kitchen Heaven, Healthy Appetite, Sunday Lunches, Cooking For Friends and Fast Food, I need a new Gordon Ramsay to sink my teeth into. Ultimate Cookery Course is on my Christmas list, so if I were to win it, it would free up space for something else from Santa. I would buy my meat at Checkers by the sounds of it! Good luck in the contest everyone! Enjoy the book Tandy! Would absolutely love to win this! Even though I spend most of my free time in the kitchen, this would be a fantastic lesson in improving my “basics” and learning fantastic skills – you can never learn enough! Such an awesome competition Tandy! Funnily, I had just been thinking to myself that I need a cookery book that works though all the important techniques for cooking in order to up my skills – Gordon’s would be perfect! What an awesome giveaway, good luck to all entrants! I have just watched this series and really enjoyed it – would love the book. Gordon Ramsay is a legend in his own time, that he endorses Checkers takes him a level even higher in my esteem. Besides, I’m newly single and very lonely and can think of no better bedtime companion *big wink* I have a huge crush on the man.